Broadly debated betting tax hike was rejected by the Irish Minister for Finance Paschal Donohoe, local media reported on Wednesday. Betting operators will still be taxed on 1% on their revenue in 2018. However, Minister Donohoe confirmed that a change in the way licensed bookmakers are taxed by the government of Republic of Ireland may be introduced in the country’s budget plan for 2019. As mentioned above, gambling companies that are licensed to provide betting services to Irish customers are currently paying 1% on their annual revenue. There has been pressure from concerned parties that the rate be increased at least by one percentage point. Here it is important to note that Ireland’s betting tax is among the lowest in Europe and the rest of the world. As part of discussions over the preparation of Budget 2018, the Department of Finance introduced earlier this year three options for the future of Ireland’s betting taxation regime. If any of these had been adopted as part of the country’s budget plan for 2018, it would have resulted in additional proceeds of around €50 million being raised from locally regulated bookmakers. The first option, which was also the most popular with lawmakers, proposed doubling the current 1% rate. The second option, as revealed by Minister Donohoe, suggested the introduction of a completely different system that would have taxed bettors instead of bookmakers. And the third and final one included replacing the current taxation base with a new one. As explained above, the government taxes operators on a portion of their revenue. The new system would have taxed licensed bookmakers on a portion of their gross profit. The proposed 1% tax increase turned out to be the most popular with lawmakers. However, it was heavily contested by the industry. Bookmakers warned that such an increase could inflict great damage upon the industry and those employed by it. Job losses and closure of businesses, particularly of ones run by smaller, independent operators, were among the reasons against the tax hike presented by betting licensees. Following the news about the potential increase of the current betting tax, the Irish Department of Finance received 13 submissions against the proposal. Eight of these came from betting industry stakeholders and two were filed by the country’s horse racing industry. The other were submitted by a service advocating for the interests of gambling addicts and by individuals. The proposal that involved taxing betting customers also faced arguments against its implementation. It was believed that such a move could result in bettors moving to unlicensed operators to avoid being taxed. Minister Donohoe was also provided with instances of other countries taxing bettors and the negative consequences they had suffered from that. As for the proposed gross profit tax, Minister Donohoe was informed that its implementation would require significant preparatory work. However, he was told that such a tax would be of “advantage to business” as the payable tax levels will thus respond to margins. As a response to the information he was provided with in relation to the proposed changes in Ireland’s current betting taxation system, the country’s Finance Minister eventually decided that a betting tax review would not be part of Budget 2018, and that he would consider the move next year when discussions over Budget 2019 commence. The post Ireland to Keep Betting Tax at Current Level in 2018 appeared first on Casino News Daily. It was a changing year in 2017, as Dr. Phil would say, for Las Vegas and the city’s tried-and-true iconic marketing strategies. Hoping to lure more millennials and ultimately to bounce back from one of the worst tragedies since the MGM fire in 1981 that killed 85 people, Sin City finished out the year still grappling with this Brave New World. While the first commercially available virtual reality (VR) headsets were released mid-2016, with a slower than expected uptake, it was only this year that the marketing power of the medium truly began to be realised. Zombie Survival is just one of the immersive VR experiences at Las Vegas’ first ever free-roaming multi-player VR arena, which opened in September at MGM’s palace of millennial skill-gaming, LEVEL UP. Expect many more compelling and creative experiences in the coming years from casino companies as this exciting new technology develops. More traditional Vegas shows continued to be a big draw, but there was also talk of a new genre of entertainment, such as Sharknado Live, a musical send-up of the hammy sci-fi series which is set to open at a yet-unnamed Caesars property sometime in 2018. But for all this new-fangled tech and talk of embracing the future and attracting millennials through arcade-style gaming and non-gaming amenities, the Las Vegas Convention and Visitors Authority (LVCVA) reverted to a tried-and-tested classic when it came to its overall marketing campaign in 2017. The iconic slogan, “What happens here, stays here” was back on our screens in a new TV spot, and translated into three different languages in a bid to capture a wider global audience. Because if it ain’t broke, why fix it? The “What Happens Here” campaign has been one of the most successful advertising pushes of all time, encapsulating perfectly the city’s promise of escapism and boundless adult freedom. Created in 2003 by ad agency R&R Partners, it has inspired movies like The Hangover and What Happens in Vegas, which have helped to propel it into the pop culture vernacular. Meanwhile, MGM’s Welcome to the Show ad-opic was a yawning, clichéd, and very pleased-with-itself social media and TV campaign, hellbent on asserting the company’s perception of itself as an entertainment giant. It barely mentioned gambling. “We are not in the hotel business, we are in the holy sh*t business,” it claimed. “We invented MGM to entertain the human race, to blow the mind of all mankind,” it added, even more preposterously, as it showed shots of real Roman coliseums, Viennese waltzes (that one was inexplicable), and other well-known events with which the company clearly wished to be associated. But on October 1, 2017, within 30 minutes of the worst mass shooting in modern American history, the LVCVA the campaign was pulled indefinitely. MGM’s Show followed shortly afterwards, deemed “too festive” in the aftermath of the tragedy. “It would be completely insensitive to go out with a sort of carefree, have fun, let loose kind of message,” R&R Partners CEO Billy Vassiliadis told the Las Vegas Review Journal about the LVCVA campaign. More likely, the “holy sh*t” business suddenly took on a dark meaning that was never intended, but that would forever be echoed after the Mandalay Bay shootout that took the lives on 58 and injured more than 500. Suddenly, not only was Vegas under the spotlight, it was under it in both newly horrible and glorious ways. The city’s first responders’ speedy and selfless commitment to getting victims to care was broadcast everywhere, and a softer, more human face became indelibly etched on the Las Vegas Strip’s previously daunting facade. But how do you market a city so famous for being brash and glitzy and fun as it faces the most somber moment in its history? That was the conundrum now faced by Sin City’s marketing gurus. For most, the answer was, you don’t. You can’t market “adult fun” reverentially. Instead, it was a time to pause and reflect, before this resilient city and its people decided to get the party started again. Meanwhile, #VegasStrong was trending organically on Twitter, as people from all over the world who loved the city offered support. But it took MGM just two weeks to cobble together its own #VegasStrong TV ad spot, narrated by Andre Agassi. “Together we are one, together we rise, together we shine,” was the message superimposed over an image of the Strip, before the spot cut away to the MGM logo. Reactions were mixed, although many accused the company of attempting to commodify a major tragedy. Somehow, MGM had managed to replace an already tacky ad with something profoundly more distasteful, making the gaming conglomerate winner for “Worst All-Around Casino Marketing” in 2017 in our own informal poll. A concurrent LVCVA Visit Las Vegas campaign looked like a compilation of Facebook images put to one of that social media’s low-tech algorithm pseudo-videos. With nearly funereal music and a tone so boring and somber, it mostly put us to sleep, we can only hope that 2018 sees a renewed commitment to market Las Vegas for what it truly is about: gambling, drinking, dining, shopping, and getting no sleep. The post Las Vegas Switches Gears for 2017 Marketing Strategies: Courting Millenials, Skirting Tragedy appeared first on Casino.org. The gaming industry had a dynamic 2017, but for casino operators, there’s only one true way to count success, and that’s by taking a look at their ledger sheets at the end of the year. The top dogs in the business didn’t get there by being faint of heart, and this year, the industry’s notables took risks and faced their antagonists head-on. The result was hefty compensation all around. Many of the top names in the sector are billionaires, counting themselves among the richest people on the planet. Here’s a look at a few of the major executives and owners who made the big bucks in 2017. When it comes to the richest of the rich, there are few who have the vast resources of Sheldon Adelson. The Las Vegas Sands CEO and chairman has a net worth of approximately $32.6 billion, according to the Bloomberg Billionaires Index, and his piles of cash only got deeper in 2017. Adelson saw his annual salary increase from $1 million to $5 million, and along with performance-based bonuses, his total compensation package could be worth more than $17 million a year. But his biggest financial move may have been the one he didn’t end up making. The billionaire dropped out of a bid to bring the Oakland Raiders to Las Vegas, withdrawing his $650 million in funding for a proposed NFL stadium after saying that the Raiders had left him out of discussions over the arena’s lease agreement. Steve Wynn also had quite the year, with his biggest windfall coming in January. That’s when Wynn Resorts awarded its CEO with a stock package distribution worth $12.5 million. Wynn immediately sold $5.2 million in stock, providing himself with plenty of spending cash to start the new year. The casino mogul has other big money stock issues pending, though. Former Wynn Resorts board member Kazuo Okada is suing the company over his 2012 dismissal and the forced redemption of his 20 percent stake in the firm, a move that Okada says wasn’t made by the board because it was in the best interests of the company, but rather on orders from Steve Wynn himself. Another CEO to earn a raise in 2017 was MGM Resorts CEO James Murren. The 54-year-old executive received a new contract in October 2016, and while his base pay remained at $2 million a year, his bonuses and stock awards both increased in April, resulting in a total bump of about 25 percent. Murren may be hard-pressed to get that kind of raise again in 2018, however. Following the tragic mass shooting in Las Vegas on October 1, MGM is facing lawsuits from more than 450 victims. While most damages are likely to be paid by insurers, the legal and public relations ramifications from the shooting will extend into 2018 and beyond. On the other hand, Caesars Entertainment President and CEO Mark Frissora reportedly took a pay cut in 2016, though his compensation package of $9.5 million was still more than enough to keep him living large. That could easily change when his 2017 earnings are announced. Frissora helped Caesars emerge from bankruptcy after a three-year effort, and in October, he spoke to investors about the corporation’s plans to grow their operations not only in Las Vegas, but also in other global destinations like Japan, Brazil, and South Korea. So where will the big money players be focused heading into 2018? Increased competition may be the biggest concern to their respective bottom lines, particularly in the northeastern United States, where new casinos in Massachusetts and Connecticut, along with the introduction of online gambling in Pennsylvania, could put a lot of pressure on markets that are already beginning to feel saturated. High stakes are at play in Asia as well coming into the new year. Not only will Japan likely grant final approval for the nation’s first integrated resorts, but regulators in Macau are also expected to announce the rules that will govern the renewal of gaming license concessions in the Chinese territory. Both could lead to fierce competition amongst some of the largest gaming firms in the world, each of which wants to be a leader in these lucrative markets. And you know what that means: bigger payouts for the gambling industries biggest moguls in 2018. The post Top Gaming Industry Salaries of 2017: Which Casino Barons Brought Home the Most Bacon appeared first on Casino.org. Casinos across the US and its territories, as well as in Macau, bore the wrath of Mother Nature over the past 12 months. In the end, it was gambling revenues that took the hit, as numerous Cat 4 and 5 hurricanes and typhoons pummeled both the American and Asian gaming markets in 2017. Casino closures, guest room cancellations, and inaccessibility following storm damage were among the factors that caused the industry to feel the pain at the bottom line this past year. The 2017 Atlantic hurricane season was hyperactive, with six major Category 3 or stronger storms hitting the US, Puerto Rico, and the Caribbean. Over 420 people died, and final damage estimates are predicted to be close to $200 billion across the board. The first major hurricane this year to make landfall in the US was Hurricane Harvey, a Category 4 storm that hit Texas and the Houston area in late August. While the hurricane devastated much of southeastern Texas, riverboat casinos located in nearby Lake Charles, Louisiana, were spared. Despite being docked in Galveston, the Jacks or Better casino cruise ship got lucky. Just 50 miles southeast of Houston on the Gulf of Mexico, the company, not necessarily advisedly, resumed providing gambling tours just days after much of the state endured a Category 4 hurricane. Almost at the exact time that Harvey was doing damage in Houston, over 8,000 miles away in Macau, Typhoon Hato was delivering massive blows to China’s special gaming enclave in August. The storm was the strongest to hit Macau in 53 years. Ten people died, and Hato caused almost $2 billion in damage in South China. The storm closed casinos and caused delays to the MGM Cotai , which is now expected to open its doors in January. Executives from the six licensed casino companies in Macau, which will begin seeing permits expire as of 2020, stepped up to help aid in the city’s recovery. Combined, the six operators donated $26.7 million to Macau charities. Las Vegas Sands and its founder Sheldon Adelson led the way, with a $12.3 million pledge. Wynn Resorts gave $3.75 million to Macau, and another $3.75 million to Houston’s Harvey, an altruistic move, considering there are no legal land-based casinos in Texas. Hurricane Irma, a Category 5 storm that was deemed the most powerful hurricane ever recorded in the Atlantic basin outside the Caribbean and Gulf of Mexico, hit landfall in the US in early September. The storm pummeled towards Florida, but casinos and parimutuel tracks fared well. Many gambling venues provided electricity and a climate-controlled escape, as power was slow to be restored in the southern part of the steamy and warm Sunshine State. The final bad weather chapter in 2017 was devastating. Category 5 Maria targeted Puerto Rico, and made landfall on September 20. The storm caused catastrophic damage, and led to a humanitarian crisis, as hundreds of thousands went without fresh water, fuel, electricity, phone service, and other vital basic necessities for weeks. Casino resorts across the island were closed for days after the storm, but began reopening in the weeks following Maria. The post Casinos Pay Price for Unusually Stormy Year, as Mother Nature Lets Loose in 2017 appeared first on Casino.org. The post Yggdrasil deals with Snaitech to expand its Italian footprint appeared first on Casino News Today. A year of big changes may be coming for Atlantic City and New Jersey’s gambling industry. In the first place, Atlantic City, once the only casino gaming hub on the US East Coast, will see the re-opening of at least one previously closed casino. This is hoped and expected to boost the city’s casino industry after a streak of unpleasant events from the past several years. In the second place, New Jersey might emerge the winner from a legal battle against major US sports leagues over the legality of sports betting in the state and the nation. The lawsuit is currently reviewed by the Supreme Court, and it is believed that a ruling will be issued sometime in the first half of 2018. Prior to 2008, when the Great Recession sunk its teeth into the US, Atlantic City was one of the world’s most popular casino destinations. With the major economic crisis and the opening of new casinos in other states along the East Coast, the city gradually lost its luster and clientele to experience unprecedented drop in gaming revenue. That eventually culminated in the closure of five casinos over a period of two and a half years. It can be said that Atlantic City has improved significantly since five of its twelve casinos closed doors between 2014 and 2016. What is more, there has been growing investment interest in the city and its casino industry. The spring purchase of the former Trump Taj Mahal casino resort by Florida-based operator Hard Rock International came as a very clear signal that Atlantic City may be ready to move on from its tumultuous times. Hard Rock pledged $500-million investment into renovating and reopening the gambling venue, originally owned by US President Donald Trump, and expressed optimism about its future success. The property is slated to open doors in the summer of 2018. Earlier this month, news emerged that another closed property may reopen next year. The former Revel, which opened in 2012 and was shuttered in 2014 after failing to make a profit, was reportedly sold to Colorado-based AC Ocean Walk LLC for $200 million. Florida real estate developer Glenn Straub, the current owner of the closed casino resort, denied reports about the sale. However, those reports were joined by ones according to which AC Ocean Walk has applied for a casino license with the New Jersey Casino Control Commission with the intention to restart operations at the property in 2018. It is still to be confirmed whether the sale and the reopening will take place. If this happens, this will mean that nine casinos will be welcoming patrons on the Boardwalk at a time when Atlantic City is striving for revival. The US Supreme Court held its first hearing on the sports betting case earlier this month. While a decision may be up to half a year from being made, supporters of the legalization of sports betting saw indications of support from the nation’s highest ranking court and are optimistic about a positive outcome. During the hearing, there were justices who commented on the fact that the current federal law prohibiting sports betting in the country actually does not have the right to “tell [New Jersey] how to legislate”. If this argument gains more support, this may result in a ruling that will change the gambling landscape not only in New Jersey, but also in the US as a whole. According to information from the American Gaming Association, over $150 billion is annually wagered on sports by Americans. If sports betting is regulated and legalized beyond the four states where the activity is currently legal (those being Nevada, Delaware, Montana, and Oregon), this will create one of the world’s largest sports gambling markets. However, analysts voiced concerns that even if New Jersey’s case gains support from Supreme Court justices, their ruling may be narrowed to just that state, and may not involve a general lift of the current nationwide ban. The post New Jersey’s Gambling Industry Enters Year of Big Changes appeared first on Casino News Daily. The Government of Macau has honoured the Hong Kong businessman Lawrence Ho, who is also the chief executive officer and chairman of Melco International and Melco Crown Entertainment, for his massive contribution to the tourism sector of the autonomous region. Mr. Ho was awarded with the “Medal of Merit – Tourism” after a recommendation made by a Macau Government committee. The official announcement was made on Tuesday, on the eve of the 18th anniversary of Macau becoming part of the Chinese administration from the Portuguese one. According to the announcement, Mr. Ho was one of the 42 individuals and organizations that has contributed most for the region’s economy and tourism sector with his overall achievements and the excellent services provided by his brands. Despite the fact that Mr. Ho is often associated with Studio City, a Melco Resorts’ majority-owned gaming resort in Cotai, opened in October 2015, offering a great variety of non-gambling facilities and no VIP gambling. At the time when Studio City was officially opened, Mr. Ho shared that the fact that was not a political decision, but a business one. For the time being, the Macau Government and the Central Government of China have been following a policy to expand the autonomous region’s economy beyond the traditional focus on gambling and more specifically, high-stake gambling for VIP customers and become more focused on non-gaming attractions in the local tourism sector. As mentioned above, at the time of the press conference given at the opening of Studio City, Lawrence Ho explained that his company had taken into account the policy that was to be followed by the government in terms of market diversification. The operating company, however, was hit by a wave of criticism due to the relatively slow gambling revenue increase generated by Studio City. This is why it applied for offering high-roller gambling services in the venue, for which it was given the necessary permission, and started offering such services from November 2016. Earlier in 2017, the CEO and chairman of Melco Resorts & Entertainment confirmed the company’s desire to seek expansion in Japan by entering the local gambling market. More clarity on the opening of the country’s casino market, including information about the operators that are going to be allowed to participate in it, is expected to be given around June 2018. As explained by Mr. Ho, his company had a number of goals it would seek to achieve over the upcoming years, and expanding in the Japanese gambling market is one of them. According to the Chairman and CEO of Melco Resorts & Entertainment, the country’s market has a great potential that only needs to be unveiled and further developed. The post Macau Government Honours Lawrence Ho for Outstanding Contribution to Tourism Sector appeared first on Casino News Daily. The post Official Post Event Press Release: Ukrainian Gaming Summit 2017 appeared first on Casino News Today. Two satellite events on 24 and 25 January and three no-limit Texas Hold'em tournaments from 26-28 January will feature $25,000 guaranteed prize pools. The North Jersey casino ballot referendum to end Atlantic City’s gambling monopoly in the state was strongly defeated by voters during the November 2016 election. That was great news for commercial casinos then under construction in Upstate New York, but next fall the question can be represented to Garden State voters. Though outgoing New Jersey Governor Chris Christie (R) also supported bringing gambling north, Governor-elect Phil Murphy (D) does too, and he might be better suited to convince residents to come to his side. Should that happen, New Jersey-based gaming analyst and consultant Alan Woinski says it would be lights out for New York’s upstate casinos. Talking with City & State New York regarding the Empire State’s three recently opened commercial casinos’ financial difficulties, Woinski opined that there would be no reason for the tens of millions of people in the New York City and North Jersey area to travel at least 60 miles just to place a bet. “If this new governor here in New Jersey is able to convince lawmakers to put a casino in the Meadowlands, it’s all over for New York,” Woinski stated. States have expanded their gambling laws across the country over the last decade in response to the US recession and governments looking for new sources of tax revenue. That’s especially true in the Mid-Atlantic and Northeast, where today commercial casinos can be found not only in Atlantic City, but in West Virginia, Maryland, Delaware, Pennsylvania, New York, and Massachusetts. Determining when enough is enough is a difficult proposition. Some say the industry has already long passed the tipping point, but those that know the industry best, Wynn Resorts and MGM Resorts, for example, continue to invest billions of dollars. MGM says its development cycle, which included the $1.4 billion MGM National Harbor, will come to a close with its $960 million resort in Springfield, Massachusetts. Wynn remains under construction on its $2.4 billion Boston property. Four years ago, the New York Legislature authorized three upstate commercial casinos in an effort to revitalize struggling communities. All three sites promised to generate big revenues, and subsequent strong tax money. But during their first year in operation, the trio of venues are heavily underperforming. Tioga Downs, for instance, predicted $262 million in gross gaming over its first 12 months. With 10 months in the books, the casino has won just $125 million. The post North Jersey Casino Would Bankrupt Upstate New York Resorts, Analyst Opines appeared first on Casino.org. The world of live tournament poker never fails to offer excitement to both those playing and those deriving pleasure from following action at the tables as spectators. Needless to say, the fact that poker offers players the chance to win life-changing amounts of money contributes to the game’s global popularity. It can be said that interest in live poker grew in 2017 and the introduction of new tournaments, with those featuring larger prize pools, certainly boosted that growth. Although it is impossible to tell how much money has been awarded to live tournament participants over the past twelve months, it can be seen quite easily who the most profitable players of the year were. Here is a quick look at these players as well as some highlights from the development of their poker careers in 2017. Winning over $8.5 million this year, Kenney even outpassed the WSOP Main Event Champion, Scott Blumstein. It can be said that 2017 was actually Kenney’s most successful year in terms of money earned from live tournaments. Only in January, the player managed to add more than $1.5 million from six in-the-money finishes from the inaugural edition of the PokerStars Championship Bahamas. A highlight from his performance during the successor of the particularly popular PokerStars Caribbean Adventure was the fact that he took down two high roller events. He first emerged the victor from the $50,000 No-Limit Hold’em for a first-place prize of $969,075. Days later he also won the $25,500 No-Limit Hold’em Shot Clock, good for $392,876. It can be said that high rollers were Kenney’s main focus throughout the year. Aside from the above-mentioned two, the player topped the fields of three more such events and cashed in quite a lot more. In April, Kenney won a $25,000 High Roller at Aria Casino in Las Vegas for $300,000. Only several days later, he flew to Monte Carlo, where he beat the field of the €100,000 Super High Roller that took place as part of the PokerStars Championship. His victory secured him with his largest live cash of €1,784,500. Blumstein became this year’s WSOP $10,000 Main Event champion. The player collected $8.15 million for remaining the last man standing from a field of 7,221 entries. Needless to say, this was his largest-ever cash. The New Jersey-based player cashed in several other events before and after this year’s edition of the WSOP World Championship, but his payouts from these were mostly three- and four-figure ones. Here it is interesting to note that his victory at the Main Event rocketed him in top five of his home state’s most profitable players, with Phil Ivey, Dan Smith, Thomas Marchese, and Chris Klodnicki being the only four people to have won more than him in live tournaments. A prominent trend from this year was German poker professionals winning a great number of the higher buy-in tournaments to have taken place over the globe in the past twelve months. This is why it is not a surprise that the top five of the 2017’s live tournament poker money list is comprised namely of Germans. Christoph Vogelsang was the most profitable German high roller this year. The player became this year’s Aria Super High Roller Bowl winner, claiming the amount of $6 million for beating 55 fellow players. The player also finished sixth in the WSOP Europe €111,111 High Roller for ONE DROP, good for €606,694. Another notable event from his career this year was his victory in a $25,000 High Roller at Aria. The player collected $261,376 for his performance in that particular tournament. Sontheimer was another German player to make quite some headlines this year. It can be said that his lucky streak began in May when he finished runner-up to his fellow countryman Christian Christner in a $100,000 Aria Super High Roller. Sontheimer collected $1,223,264 from that event. In July, he took down a €25,200 Super High Roller that took place within the Poker EM 2017 festival in Velden, Austria. His prize from the event amounted to €430,000. In September, Sontheimer became the star of Aria Casino’s inaugural Poker Masters High Roller Series. The high roller festival included five tournaments, and the young German cashed in four of them, finishing first in two of them. He took down a $50,000 buy-in and a $100,000 buy-in event, scooping payouts of $900,000 and $1,512,000, respectively. He also finished fourth and fifth in two other $50,000 buy-in events within the festival, cashing $204,000 and $117,000 from those. His performance throughout the Poker Masters secured him with the purple jacket. Fedor Holz, the leader of Germany’s all-time money leaderboard, also had quite a profitable year. Although the player announced that he was retiring from professional poker in 2016, we still got to see a lot of him during 2017. The player won several high roller tournaments over the course of the year, including the HK$250,000 No-Limit Hold’em during the Triton Super High Roller Series in Budva, Montenegro. His share of the prize pool totaled $444,893. It is also interesting to note that he won two $50,000 Super High Roller events at Aria in two consecutive days back in May. He received $330,660 for winning the first and $417,600 for taking down the second. While Holz may have failed to improve his performance from last year, when he collected more than $16 million from winning most of the major tournaments that took place, the player still had quite a good year in 2017, particularly when bearing in mind that he is a retiree after all. The post Biggest Live Poker Winners of 2017 appeared first on Casino News Daily. Ukraine’s Andrey Novak was the last man standing in the €5,300 No-Limit Hold’em EAPT High Roller 8-Max that concluded the partypoker EAPT Prague festival last night. Following a two-way deal with his heads-up opponent – Ludovic Geilich from Germany – Novak was crowned the victor and received €117,365 and the trophy for his efforts. As for Geilich, he left the tournament with €110,385, which he added to his poker bankroll of over $1.7 million. Here it is interesting to note that the German poker pro made another runner-up finish in a live tournament in Prague mere days ago. The player finished second in the PokerStars Championship Prague €1,100 National Championship event for a prize of €184,000. Geilich finished runner-up to Greece’s Georgios Vrakas. 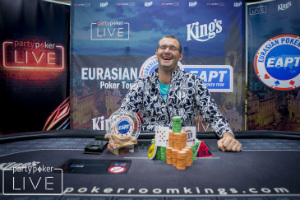 As for the Ukrainian winner of last night’s Eurasian Poker Tour high roller, it should be noted that his triumph became his best live poker accomplishment so far. Including last night’s cash, the player now has a total of $223,491 in live tournament earnings. Novak previously cashed in events that took place in his homeland as well as in Cyprus and Las Vegas. He actually took part in this year’s WSOP and cashed in three events over the course of the series. Here it is also important to note that Novak has been playing online poker for quite some time. A quick look at his PocketFives profile tells us that he has cashed more than $3.4 million online. Back in October, playing under the screen name Anjeyyy, he finished second in the World Championship of Online Poker Event #53: $2,100 NL Hold’em [Super Tuesday SE] with a guaranteed prize pool of $1.5 million. The player won $309,744.85 for his performance in the online tournament. The €5,300 High Roller was the single event Novak managed to cash in during the partypoker EAPT Prague festival. However, the player apparently performed brilliantly and eventually scooped the largest portion of the prize pool. The €5,300 buy-in tournament attracted a total of 109 entries, who generated €517,750 in prize money to outpass the €500,000 guarantee. The top 13 finishers received a share of the money, with Danish poker pro Morten Mortensen being the first to leave with a payout. Min-cashes from the two-day tournament were worth €10,000. Other notables who cashed from the event included US poker pro David Peters, who also topped the field of the PokerStars Championship Prague €2,150 No-Limit Hold’em Turbo mere days ago. The player finished tenth in the partypoker EAPT High Roller, good for €12,500. Finland’s Juha Helppi, Spain’s Sergio Aido, and Poland’s Dzmitry Urbanovich were also among the well-recognized players who left the €5,300 buy-in High Roller with a cash. They finished ninth, eighth, and sixth, respectively for prizes of €15,000, €20,000, and €32,500. The €5,300 High Roller was the final tournament on the schedule of the partypoker EAPT Prague festival. However, it is important to note that the Czech Republic’s capital is still an arena for quality poker action as the PokerStars Championship Prague is underway. The post Andrey Novak Wins partypoker Eurasian Poker Tour Prague €5,300 High Roller Eight-Max appeared first on Casino News Daily. The famed Cal Neva Resort and Casino, which straddles the California and Nevada border on Lake Tahoe’s north shore, is about to get another owner who needs little introduction. Oracle founder Larry Ellison, whose fortune is estimated to be worth more than $50 billion, which makes him the planet’s seventh wealthiest person, is paying $35.8 million for the bankrupt casino resort that was famously owned by legendary entertainer Frank Sinatra. The deal was first announced back in October, but Ellison threatened to walk away after the transaction was delayed in bankruptcy court. In billionaire terms, Ellison’s acquisition of Cal Neva is small peanuts. Five years ago, he paid $300 million for 98 percent ownership of Hawaii’s Lanai island. The Cal Neva sale holdup was due to previous creditors who are looking to recoup some of their losses. Criswell Radovan, a real estate development firm based in California, began a $49 million renovation in 2013. The massive renovation, which included refreshing all 220 guestrooms, the main restaurant, and casino floor, was nearly complete when Criswell Radovan filed for bankruptcy last year. Creditors who loaned the developer the $49 million remain on the hook for the financial disaster. After Ellison was the only bidder on the Cal Neva bankruptcy auction, they filed a lawsuit to mandate the purchase price largely go to them. The lawsuit delayed the sale, but after weeks of negotiations, a deal has been struck that satisfies all three sides (Ellison, creditors, and the court). Under the terms, roughly $27 million of Ellison’s $38.5 million will go to the outstanding creditors. Ol’ Blue Eyes bought the resort in 1960 and it quickly became a Rat Pack retreat for his A-list celebrity pals. But federal officials and the Nevada Gaming Control Board (NGCB) began surveilling the property after reports surfaced that known mobsters were frolicking the casino. Sinatra’s gaming license was revoked in 1963, and the entertainer soon afterwards sold the property. Cal Neva has never returned to its early 1960s’ prominence, but Ellison hopes to change that fact in the coming years. Larry Ellison hasn’t divulged any details as to what the future might hold for Cal Neva. He’s currently building an 18,000-square-foot mansion in nearby Snug Harbor, Lake Tahoe, described as a “getaway” house for the tech tycoon. While Ellison owns properties all around the world, he doesn’t own any casinos (that we’re aware of). But there’s no mandate that says Cal Neva include a gaming space, and the Lake Tahoe region is more known for both its summer and winter recreational activities than its gambling. In fact, there are just three casinos on the Lake Tahoe North Shore, the Crystal Bay Casino, Tahoe Biltmore, and Grand Lodge. Combined, the three floors generated $26 million in total gaming win over the last 12 months. The post Deal for Sinatra’s Cal Neva Resort Back On, Oracle Founder Larry Ellison to Pay $35.8 Million appeared first on Casino.org. The insider trading trial involving former Amaya CEO David Baazov and two other individuals officially began on Monday. The businessman and his co-accused appeared in Québec court yesterday for the first hearing within what has been billed as Canada’s biggest insider-trading case. It was last spring when Québec’s securities regulator Autorité des marchés financiers (AMF) laid insider trading charges against Mr. Baazov as well as Toronto financier Yoel Altman and Benjamin Ahdoot, a long-time friend of the former Amaya CEO and a Vice President of Government Projects at said company at the time breaches allegedly took place. Mr. Baazov was accused of aiding trades while possessing privileged information, of communicating the information, and of attempting to influence the price of Amaya shares in the period before the company’s acquisition of Isle of Man-based Rational Group, the owner of PokerStars. The deal, worth $4.9 billion, was completed in August 2014 and made Amaya the largest online poker company in the world. Both Mr. Baazov and his co-accused have denied any wrongdoing. However, the charges against them carry fines of up to $5 million and a penalty of up to five years in prison. According to preliminary timelines, it is believed that a verdict would not be issued before July of next year, which will make the process, together with all events leading up to it, quite a lengthy one. However, Mr. Baazov’s defense asked the court on Monday to stay the proceedings, and if this happens, the businessman and his alleged accomplices might walk out free people. The stay motion will now be considered by Justice Salvatore Mascia. The greater part of Monday’s hearing was dedicated to the defense and the prosecution presenting their arguments on why the requested stay should be granted or dismissed. Lawyers for Mr. Baazov and his co-accused argued that they were presented with a large batch of over 16 million documents related to the case back in September. A second batch of documents was given to the defense last Friday, it became known yesterday. Lawyers said that it was really hard for them to prepare adequate defense given the vast amount of papers they had to review. Dominique Shoofey, one of the lawyers defending the former Amaya executive, said that a large number of documents are yet to be evaluated by them, and that constitutional rights were currently at stake. If the court delivers a verdict in July 2018, this would mean that the decision was made 28 months after the AMF charges were laid. That timespan exceeds the 18-month presumptive ceiling for provincial courts introduced through a recent ruling of the Supreme Court of Canada. The ruling, known as the Jordan, has been applied by other courts in different ways. It is yet to be seen how it will apply to Mr. Baazov’s case and whether a stay will be granted, as requested by the defense. The post David Baazov Insider Trading Trial Begins with Stay Request appeared first on Casino News Daily. Two women did the statistically improbable and won significant amounts of money on not one, but two lottery scratchers in the same day. The state lottery windfalls were in different states but both in the month of November. Veronica Buchanan of Florissant, Missouri and Michelle Shuffler of Granite Falls, North Carolina each won two prizes off scratcher tickets. Buchanan won $101,000 and Shuffler won $1.01 million. Odds for scratch off games are much better than regular lotteries, like PowerBall, which to win the grand prize is 1 in 176 million. Getting any prize on a scratch off is 1 in 4 and winning an amount of $10,000 or more is about 1 in 90. There are no odds provided of winning two large sums of cash in the same day on two different sets of tickets like Buchanan and Shuffler did. Buchanan walked into a local gas station on the morning of Nov. 29 and bought a $10 Monopoly scratch-off ticket. She won $1,000. Later in the day she returned and bought a $10 Fortune ticket and walked away with one of the 14 $100,000 prizes. Monopoly is a $10 game that went on sale in August 2015. Prizes range from $10 to $1 million, with a total of $38 million in the prize pool. Two of the three $1 million prizes remain unclaimed in the game. Fortune is run similar to the Monopoly game and has a total of $37 million. Two of the $1 million tickets remain unclaimed. Shuffler bought her first ticket with her husband when they stopped at a gas station in Lenoir, North Carolina the middle of November. She purchased a Million Dollar Fever scratch-off ticket. She discovered she had won $10,000 and the two were shocked. They traveled 22 miles down the road and decided to stop at a convenience store near their home in Granite Falls and bought another ticket. It proved to be a profitable decision. She uncovered $1 million winner and couldn’t believe her good fortune. Shuffler decided on taking the yearly payouts of $50,000, instead of a lump sum of $600,000 after taxes. She told the lottery commission she was going to take her $35,000 after taxes and use towards retirement and her children’s college education costs. The post Two Women Find Lottery So Nice They Won it Twice appeared first on Casino.org. Ryan Tosoc entered the 2017 WPT Five Diamond World Poker Classic Main Event hoping to improve from last year’s runner-up finish in that same event. Moments ago, the player delivered on his goal. He bested a field of 812 competitors, with that number representing record-breaking attendance for that particular tournament which has been part of the WPT’s Main Tour schedule since the poker series inception. The player collected $1,958,065 for his performance and had his name engraved on the WPT Champions Cup. 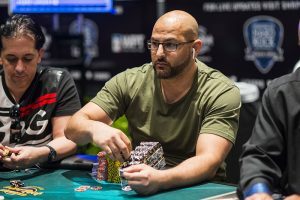 Tosoc entered the final day of action second in chips with a total of 5.105 million and with Sean Perry being the only player with a larger stack at the start of the official six-handed final table. Talking to WPT staff prior to Day 6, Tosoc said that he has always felt comfortable and confident in his game when playing at the Bellagio, the casino that hosted the WPT Five Diamond World Poker Classic. Last year, the player finished runner-up to James Romero in the Main Event, collecting $1.1 million for his deep run. With that said, this year’s champion now has more than $3 million in winnings in back-to-back editions of the same tournament. Last night, Tosoc faced Alex Foxen heads-up. The eventual winner had substantial lead over his final opponent. Tosoc held 14.995 million to Foxen’s 9.37 million at the start of the two-handed match. However, chips swung back and forth for several hours providing for action-packed match. Foxen emerged as the chip leader shortly after the beginning of the duel, and managed to build quite a stack within the course of several hands. However, Tosoc regained momentum and the chip lead. Halfway through the match, Foxen once again took control over the bigger portion of all chips at the table. However, his momentum did not last long, and Tosoc assumed controlling advantage over his final opponent to never look back. Hand #124 was the final hand of the final table and the tournament as a whole, and it was the 50th hand of the heads-up match. It saw Tosoc raise to 500,000 from the button and Foxen three-bet shove for his last 2.9 million. Foxen tabled [Ah][10c] to Tosoc’s [Qc][10h]. Later on, the eventual winner said that he just felt this was the end of the tournament. The board ran out [9h][3d][Kd][Jh][Jc] to secure Tosoc with a winning straight and to bust Foxen in second place. While he had certainly vied for the title and the first-place prize, Foxen still won a life-changing seven-figure payout of $1,134,202. Mike Del Vecchio, the only former WPT champion at the final table, finished third in the tournament, good for $752,196. Sean Perry, the Day 6 start-of-the-day chip leader, took fourth place for $504,090. Ajay Chabra took fifth place, good for $350,500. Richard Kirsch rounded out the six-handed final table for $271,736. The post Ryan Tosoc Wins Record-Breaking 2017 WPT Five Diamond World Poker Classic $10,400 Main Event appeared first on Casino News Daily. The battle between Scientific Games and William Hill over the acquisition of NYX Gaming has seemingly come to an amicable conclusion, as William Hill is now providing support for the deal. In a press release distributed on Wednesday, Scientific Games announced several developments that make its takeover of NYX likely to proceed without major incident. Most notably, both NYX and Scientific Games were able to announce that they had entered into independent agreements with William Hill and AlpInvest Partners CoInvestments to support the announced acquisition. In total, William Hill and AlpInvest control about 40.9 million ordinary shares of NYX, adding substantial support ahead of a planned December 20 shareholder vote on the deal. In addition, all parties have entered into a settlement in which all sides have agreed to end all litigation against each other in relation to the proposed takeover. Scientific Games and NYX had filed lawsuits in Nevada and New Jersey, respectively, claiming that William Hill was illegally trying to block the takeover in order to protect itself against potential competition in case sports betting were legalized in the United States. The agreements appear to end the maneuvering that was taking place ahead of the shareholder meeting. According to NYX, the acquisition would only be prevented if 51 percent of shareholders did not approve of the takeover, and that the termination clause in place specifically excluded William Hill and its affiliates from taking part in the vote. On their end, William Hill said they hadn’t yet made a decision on where they stood on the proposed deal, but that they certainly wanted a seat at the table when the shareholders discussed the possible takeover. At the same time, the sports betting giant worked to increase their influence at that table by converting its convertible preference shares to ordinary NYX shares. As part of the latest round of agreements between the parties, William Hill has withdrawn its notice of conversion of those shares. The corporate maneuvering follows a September announcement in which Scientific Games agreed to purchase the entirety of NYX for just over $600 million. William Hill had several concerns about the deal, including some of its contractual rights that stemmed from NYX’s purchase of OpenBet in 2016. According to Phillip Bowcock, CEO of William Hill, those issues have now been resolved. “These agreements safeguard William Hill’s technology roadmap and relationship with NYX and end all legal action between the parties,” Bowcock said. The importance of this deal for all parties involved has been amplified due to signs that the Supreme Court of the United States may be leaning towards striking down the Professional and Amateur Sports Protection Act (PASPA), a decision which would allow individual states to regulate sports betting. “We are pleased to expand our commercial relationship with Scientific Games in the US market which offers considerable potential should the Supreme Court ruling on the Professional and Amateur Sports Protection Act, which is expected next year, provide states with the power to regulate sports betting,” Bowcock said. The post William Hill Adds Support to Scientific Games Takeover of NYX appeared first on Casino.org.